In the USA, General Motors is partnering with the three main charging station networks. Namely EVgo, ChargePoint and Greenlots will be providing customers of the all-electric Chevrolet Bolt with access to more than 31,000 charging points. Nissan and EVgo have opened an EV fast-charging corridor along the I-95 from Washington DC and Boston. The stretch features fifty-two 50 kW HPCs in nine locations. EVgo, one of America’s largest public charging networks, is expanding. They added three new executives to the Board. Ivo Steklac is to become CTO, Jay Goldman their VP of Business Development, and Olga Shevorenkova is the new VP of Corporate Development and Strategy. The US state of Virginia has decided to use their funds from the Volkswagen diesel scandal to set up a new vehicle charging network. The partner chosen to implement the initiative is EVgo. 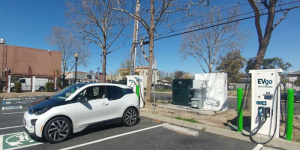 For the first time, EVgo equipped one of their fast-charging station with a back-up made from reused batteries from the BMW i3. For now said stationary set-up is a standalone but EVgo say they are planning to expand such second-life applications. General Motors and EVgo say they want to install “hundreds” of EV charging stations for use with GM’s Maven car sharing service. The growing numbers of gig drivers using the Chevy Bolt EV will now get a dedicated DC charging network across the States. EVgo has simplified its price plans with immediate effect, lowering costs for DC charging while also allowing longer charge windows. The declared aim is to match or beat gasoline prices on a per mile basis. StreetScooter, innogy, EVgo, Nissan, Freiburg. StreetScooter goes Austria: Deutsche Post/ DHL expands its electrification across the German border, where Vienna’s 5th district will see electric only mail delivery with StreetScooter vans. Margareten is thus the first “DHL Green District” in Austria and shall not be the last. While DHL operates in Austria only since 2015, Germany already got a fleet of 3,000 StreetScooter and another 100 home-made electric vans serve in the Netherlands. U.S. subsidiary RWE subsidiary innogy has founded a new subsidiary to enter the States. Dubbed innogy e-mobility US LLC will be based in Los Angeles and offer both services and technology. They opted for local Cameron Funk as CEO. Open street charging: Sacramento wants EVgo to install six pay-to-charge stations in the Californian city. An initial three chargers and four electric-only parking spots are expected to be in place by mid-2018, with expansion dependent on their success. The city already has over 400 chargers installed on public and private property. Nissan Leaf comes to Chile: 25 Leafs have arrived in Santiago de Chile, where they will be used by Enel employees. The utility is also a major V2G partner to Nissan in Europe and now in Chile. Here, the 25 Nissan EV mark the start for availability for fleet owners exclusively. Heavenly help: Freiburg’s achdiocese proves forward thinking and took charge of 17 Renault Zoe. With their arrival, the EV flock grows to almost a third of the entire fleet and shall serve at different locations. Fastned, Denmark, Nissan, EVgo, AAA, Georgia Power. Do the Dutch do it better? It seems so considering that they will be the ones to electrify the German Autobahn. Fastned announced its expansion across the border and will line the highway with 14 fast-charging stations open to all electric car types, a first in Germany. In the Netherlands the company has 60 of 201 planned stations operational. Reverse to forward: Denmark is taking back its anti-EV policies the conservative government has (re-)introduced only last year, when it phased out the tax break on EVs. Since then sales had become virtually non-existent and so the incentive programme is now being phased back in place – almost. Instead of the tax being capped at 40 percent, it will halt at 20% until sales reach 5,000 EVs at least. 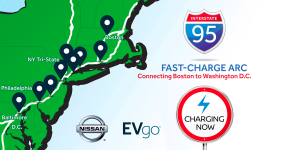 East coast all the way: Nissan and EVgo have made plans public to connect Boston and Washington D.C. with 50 fast-charging stations at nine locations. The chargers will support CCS as well as CHAdeMO and be ready by fall. The ‘I-95 Fast-Charge ARC’ will be pre-wired for 150 kW. Hybrid Gig in California: The American Automobile Association (AAA) will launch its own hybrid car sharing called Gig in Berkeley and Oakland this month. 250 Toyota Prius C will form the first fleet. Teaming up for electric transport are utility Georgia Power and the baseball club Atlanta Braves. They will install 61 EV charging stations around the SunTrust Park stadium. Research tip: If demand charges are applied to public charging, charging an EV during peak hours could become 7 times more expensive than the gasoline equivalent measured in kWh. The findings come from the Rocky Mountain Institute’s latest EVgo Fleet and Tariff Analysis. On-site storage may have just become a stronger business case. Reading tip: Tesla sells faster and better on second-hand markets than other cars, a report by online car shopping service Autolist finds. In short, the Model S retains its value for longer. EVgo now operates 900 EV Chargers in the U.S.
EVgo has opened its 900th EV charger on American soil. It is located in Nashville, Tennessee and includes two fast-chargers made by BTC Power. Each one can deliver a 50 kW charge at the same time. Strangers in Tesla Town: EVGo and ABB are about to venture into Tesla’s backyard in Californian Fremont, where they plan to install a fast charging station capable of 150 – 350 kW. The high-power charger will be made available to carmakers only to test new systems. Leafs for cabs: Glasgow-based Taxi Centre has taken delivery of 15 Nissan Leafs but projects it will make more than 100 sales in the next 12 months and more than 300 the year after. The electric cars shall serve as taxis and join the 200 Nissan EV taxis in operation across Britain. First responders electrified: North West Ambulance Service NHS Trust (NWAS) will start with four electric vehicles as a trial. The Trust will look to replace its whole fleet of 174 cars with the new electric models gradually in the coming years once the life-span of the current vehicles comes to an end. Smart streetlight with EV charging: Infineon together with Eluminocity developed an intelligent LED street lamp that can charge electric cars as well. Its radar also detects free parking space and signals its availability to the cloud. More sensors measure air quality. EV boost in UK: The Department for Transport introduced the Vehicle Technology and Aviation Bill, which calls for more electric cars. Charging infrastructure was identified as the main issue and may be solved by forcing motorway services to provide EV charge points and hydrogen refuelling stations. Also, EV drivers shall have easier access to information on availability of charge stops. 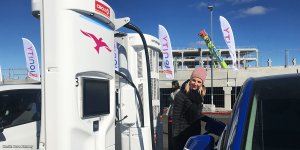 Charging the Czech Republic: More than a billion krona or 37m euros have been earmerked by the government in Prague to install 1,200 EV charging stations across the Czech Republic before the decade’s end. The plan is also driven by VW’s Czech brand Skoda, that will electrify by 2019. Tesla will double the number of Superchargers in America before the Model 3 will hit the market this year. At the moment, 373 such fast-chargers stand in the States but Tesla operates 805 Supercharger stations worldwide. New customers will be charged a small fee for their use. 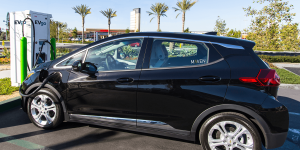 EVGo charges for Bolt free: The infrastructure provider EVGo has teamed up with car sharer Maven and Lyft to offer fast-charging at no cost for drivers of the Chevrolet Bolt EV. Additionally, EVgo is extending its 30-minute charge time limit to an hour for Bolt EV drivers. Beijing cabs to go all electric? 71,000 taxis run in the Chinese capital and 94 percent of them drive with gas. This is to change as the city plans to only allow electric, hybrid, or LPG vehicles to replace old cabs or to be newly registered. The plan might come to pass already this year. EVgo, Arriva, KEBA, E-Fleet.com, Auckland. 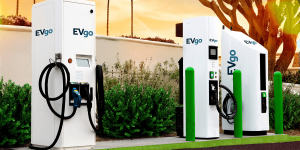 174 new fast-charger: BMW and Nissan have, as part of their cooperation with EVgo, set up another 174 multi-standard fast-chargers in 33 U.S. states. Another 50 fast-chargers are planned for this year. 174 new hybrid buses: British bus operator Arriva took delivery of no less than 174 Volvo hybrid buses, which will join the currently 44 hybrid buses already on the fleet. The new double decker buses are of the type Volvo B5LH, of which 123 are already in service in London and another 51 in Merseyside. KEBA to produce new BMW i Wallbox: The Austrian company received approval for delivery for the new BMW i Wallbox. KEBA has set up a second production line for the wallbox and the start of series production, as well as initial deliveries have already taken place. 200 EVs to share a ride: California start-up E-Fleet.com wants to provide Uber and Lyft drivers with access to the Nissan Leaf, VW e-Golf, Chevy Bolt and later the Tesla Model 3. The fleet of a total of 200 electric cars could already be made available in San Diego, Las Vegas, Seattle and San Francisco this year. E-mobility funding: Auckland will begin testing two electric buses this year and set up 60 new EV chargers. The undertakings will be funded by New Zealand’s government as part of the recently announced 3.5m dollar e-mobility grant that will be divided among 15 projects in the country. Hubject, carsharing, EVgo, Portland, North Carolina, Beijing. VW joins Hubject : The German automaker officially joined the e-roaming platform, buying a single-digit million euro stake in the company. 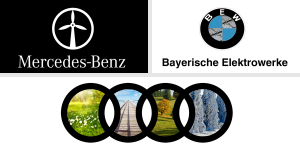 BMW, Daimler, Siemens, Bosch, EnBW, and innogy are also part of the consortium. DriveNow and car2go to join forces? According to German Manager Magazin, BMW and Daimler want to merge their carsharing businesses. Others like BMW’s charging infrastructure subsidy ChargeNow or Daimler’s MyTaxi could later join in. DriveNow stakeholder Sixxt would, however, leave the group. A reason for the merger is i.e. growing competition from Uber, etc. First 350 kW charger being built: EVgo kicked off the installation of the U.S.’s first 350 kW charging station. It has four ultra-fast connectors, as well as CCS and CHAdeMO outlets. The station will be commissioned in June. The road for the energy hungry Porsche Mission E has been paved. Portland pushes electrification: The city in Oregon and surrounding Multnomah County have passes and emobility strategy that will see the replacement of at least 10,000 diesel and petrol-cars with electric ones by 2020. Portland itself will get 60 EVs. Moreover, the number of chargers in the county will be doubled. Charging North Carolina: Duke Energy will install 200 new EV chargers across North Carolina. A list of exact locations has now been made public. The utility earmarked 1.4m dollars for the undertaking. The investment is part of a lawsuit settlement with the state, which accused the utility of illicit smokestack pollution (we reported). Smart streetlight: 20 intelligent streetlights offering WiFi have been installed in Beijing. 18 of which also include a place for EVs to plug in. The city plans to install another 100 units. Munich, Cannon, BlueCity, Evercar, EVGo. 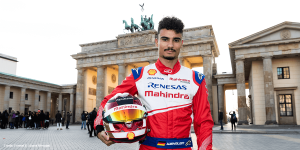 Munich goes on the e-offensive:: The city wants to successively replace 220 of its own vehicles that don’t travel more than 80 km per day with EVs by 2023. Munich says it will take delivery of the first 70 electric vehicles by the end of next year. EV infrastructure in the city will also be build up in the coming months. New turbo-chargers announced: ITT brand Cannon will present a new fast-charging system at the eCarTec in Munich next week. According to company, the liquid cooled plug and cable design has been tested at 400 amperes and 1,000 Volt. E-carsharing expands: London’s Bolloré offspring BlueCity will start offering its e-carsharing vehicles at the Gatwick airport. A total of five chargers will be installed there over the coming months. Evercar throws in the towel: The company that rented out electric and hybrid cars to Uber and Lift drivers (we reported) will do so no more. The business model was apparently not as lucrative as they had hoped. Energica, London, Nissan, CharIn, USPS, EVgo. Fast-charging for bikes: Starting next year, Energica and partners will set up fast-charging infrastructure (CCS) for electric motorcycles along popular routes in Italy and California. The company will also accept used bikes as payment for a set residual value and offer a battery guarantee for five years or 100,000 km. Chargers for London: The London Borough of Wandsworth will install as many as 125 new EV charging points in six months that will be integrated into the citywide charging network Source London. However, the cabinet has not given the final green light quite yet. Nissan is popular in Scotland: Both the Midlothian Council and NHS Lothian have opted for the all-electric Nissan e-NV200. While the latter added two of the electric vans to its fleet, the Midlothian Council now counts a total of eight electric cars on its fleet. CharIn grown: The CCS initiative has gained a new member, as Taiwanese OEM Delta Electronics has signed on. Recent newcomers included Hubject, Faraday Future, and Renault. Alternative postal cars: The United States Postal Service (USPS) has chosen six suppliers to convert its 180,000 vehicles (we reported). 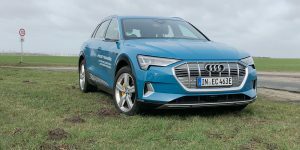 A total of 50 prototypes will be built for a six-month trial – half with hybrid, and half with other alternative drivetrains. Charge and shop: Nissan and EVgo has set up fast-charging at five Hannaford supermarket locations in the U.S. state of Maine. Users can pay with credit card or their monthly EVgo subscription. London, H2 Logic, BYD, EVgo. Britain’s BlueCity: Bolloré calls its electric car sharing service in London BlueCity despite the cars being reportedly red. Public kick off is set for February and the French provider plans to operate 3,000 EVs in the UK capital by 2019 with matching charging infrastructure. Potentially, Manchester is next as Bolloré expects the city to issue a tender for a scheme by 2016. 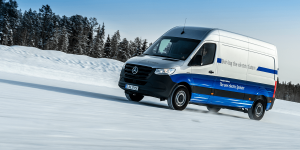 Germany will get another H2 fuel station as the H2 Mobility consortium awarded a contract to H2 Logic that includes an option for a second facility. The station will be built in the north of the country in 2016. H2 Mobility aims to install 400 stations by 2023. BYD lands in Sweden: The Copenhagen Malmö port took delivery of two electric buses from the Chinese company, a move that introduces a shipping partnership between BYD and CMP. The buses will run on local routes in Swedish Ängelholm and Eskilstuna. Freedom x 100: California’s 100th EVgo Freedom Station is open to the public. The location in Fremont features four 50kW DC Fast Chargers that can be used by multiple vehicles at the same time. All chargers support CHAdeMO and DC Fast Combo and more charge spots can be added on demand. Tesla, Malaysia, eVgo, Brimingham, London. Tesla trip trend: Driving from coast to coast in a Model S seems to be the next big thing in the states. Just recently a father-daughter team drove from New York to Los Angeles. Two more teams are already lined up and plan to complete the trip along the Supercharger route in only three days. Tesla’s CEO Elon Musk said that he will go from east coast to west coast as well, taking the whole family with him some time around spring break. Green bridge: Five Mitsubishi i-MiEV now patrol on the longest bridge in Southeast Asia, the Penang Bridge in Malaysia. Seven charging stations have been set up on the toll plaza, two of them being fast chargers. The i-MiEV is the first electric vehicle being sold in Malaysia. Birmingham charged-up: A network of 36 charging stations has been installed by the city’s council. The ‘Evolt’ charge points by APT Technologies can be found at 18 locations across Birmingham. The initiative is part-funded by the Government’s ‘Plugged-in Midlands’ programme, which plans to install about 500 charge points across the British Midlands. eVgo combo: The Californian charging network operator is ramping up its installations with now 18 stations open or in construction and 22 in the permitting process. Every site has at least one AC level 2 and one DC connection. 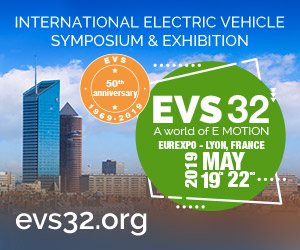 Eventually all sites will have the Combo connector, said Terry O’Day, vice president of eVgo. Electric chauffeur service: London-based Thriev car hire has just leased 20 electric e6 from BYD. Additionally, a fast charge point will be installed at the company’s headquarters. Thriev’s decision followed the Mayor’s plans for London to only allow zero-emission cabs by 2018.